One of my favorite meals is a Simple Breakfast Hash. A little bit of this, a little bit of that and you can have a delicious, hearty hash. But I really love to make a healthy breakfast hash using lots of veggies and sweet potatoes. This sweet potato hash is a healthy, nutrient dense breakfast! Made with sweet potatoes, kale, zucchini, poached eggs and finished with a bright cilantro pesto. This vegetarian breakfast hash is truly a great way to fuel your day and add a little spice your morning. Heat oil in a non stick or cast iron skillet. Add in sweet potatoes, onions, and seasonings and saute for about 10 minutes. Add in chopped zucchini, bell peppers and garlic and cook for 4-5 minutes longer, or until sweet potatoes are tender. Add in kale or spinach and saute for 2-3 minutes, or until greens are wilted. Add the eggs, one at a time, to the swirling water and gently swirl the water once all the eggs are back in the water. Let cook for 3-5 minutes, depending on how runny you want your yolks. Remove eggs from water with slotted spoon onto a paper towel lined plate. Add in the parsley, cilantro, salt, pepper, avocado, and lime juice. This makes more pesto then what you need. 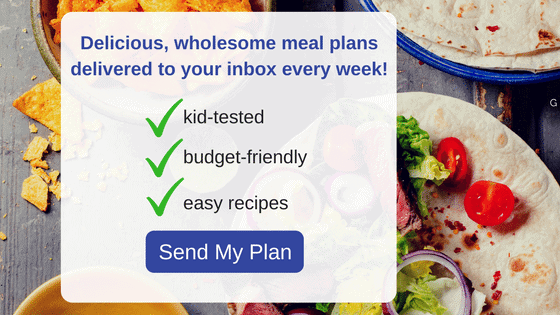 Use for recipes like Sweet Potato Nachos or to top Mexican Chicken Skillet. Divide Hash Between 4 plates. Top each plate with poached egg. Drizzle 1-2 tablespoons of Cilantro Pesto over Hash. Top with hot sauce if desired. yum! you make ALL meals look so pretty! I love breakfast hash and often make it for dinner during the week too! Love the cilantro pesto and that egg looks perfect! 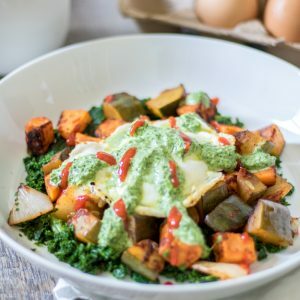 I don’t eat strictly paleo, but I tend to veer that way for meal planning and make a similar hash for breakfast – but Cilantro Pesto totally brings this to a whole new level!! So much flavor! I am not Paleo myself, but this is one Paleo dish I could eat daily! I would adore this for brunch – breakfast, lunch and dinner too. I have made it several times now and love it!!! Oh wow I can’t wait to try this dish – love making sweet potato hash and the pesto sounds amazing with it!! Perfect way to start the day or for brinner!! I think this would probably be pretty popular here because my kids like sweet potatoes and pesto! I think we are going to have to try it! Oh yes, Michelle, they will love it! Yummmm! Just put the word Southwestern in front of any recipe and I already know I will love it! This recipe sounds fantastic and the cilantro pesto is a perfect touch! Thanks Judy. The pesto is AH-MAZING! This looks like the perfect hearty (yet healthy) breakfast that you could also eat for dinner. I love the addition of arugula. Pinning for sure! I love love love hash and I love sweet potato even more! Put southwestern in front and I’m in heaven!! Gotta try this one! Yes you do NEED this in your life Michelle! This is an impressive put together breakfast!! Thanks Pam! I am truly in love with it and could eat it daily! This sounds amazing Kristen!! I love potato hash, but never tried it with sweet potatoes 🙂 Sounds SO good! Well, you must now try sweet potato hash! I think you will be happy. Huge hash lover here! That pesto sounds phenomenal! YEA! Gotta love when you can make the husband happy! Ahhh I love hash dishes! Making this one with sweet potatoes sounds yummy, and I adore cilantro pestos! Such a nice Spanish twist to a lovely topping! This sounds like the most perfect breakfast ever! 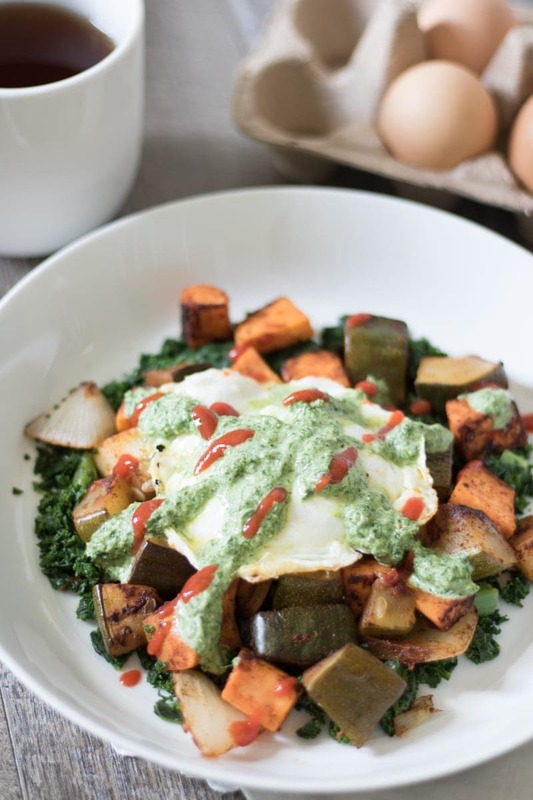 I love sweet potatoes and eggs together, but topping it with that pesto is just genius! I have to say Alyssa, it is one of my new favorites for sure! This looks like a perfect comfort meal Kristen! Just pinned for later…. Enjoy it is comfort at it’s best in my opinion. LOVE LOVE this! This looks easy & delicious! Perfect for a brunch with family & friends! So yummy! This would be great for a brunch with wow factor!! Promise this would be perfect for a fancy or casual brunch!! I’m always looking for ways to use sweet potatoes, and this is a winner! It is a great way to use them up for sure!! Breakfast, lunch or dinner… I’d eat this dish anytime of day! So awesome! Thanks Alyssa–I could eat this anytime myself. I absolutely love every sweet potato hash I have ever tried and I’m pretty certain this one would be no exception! Love the cilantro pesto! I am willing to bet you will for sure love this! Well this lack of ingredients turned into quite an amazing looking breakfast! I love making cilantro pesto, but for whatever reason, I’ve yet to use it with eggs! That just has to change 🙂 Thanks for sharing, pinning! Yes–you must try this pesto on eggs–game changer!! 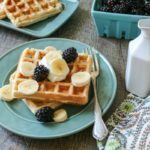 This would be amazing for brunch or dinner!! Sweet potato hash is one of my favorite things, and I love this take on it! Thank you! 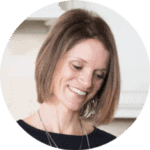 You bet–I hope you try ou this version Renee! Thanks you Olivia. It is my perfect breakfast! Oh my gosh! I could eat ALL of it! Looks so good… and I think breakfast is the best meal to share with friends..there’s just something about it. Your friends will NOT be disappointed if you serve them this! Love this potato hash with a kick! YAY!! So glad enjoy this recipe Melissa! It’s so pretty! I love all the flavors! The flavors really work perfectly together Jennifer. These flavors are SO incredible, and it’s all so healthy! Thanks so much Joanne! I am so glad you enjoyed this meal. Perfect! Love how healthy this is! It is a perfectly balanced meal for sure! We love Southwest flavors and this has is perfect!